The California Library Association is pretty much like every other regional library association I’ve seen, not least because their most visible presence is their annual conference. It may be the season, but the CLA is more politically active than others I’ve known. At their core, most such associations exist to promote efficient transfer of operational knowledge from one library to another, from one generation to another. Unfortunately, in less than a generation’s time, the very foundations of libraries has been rocked by technological, legal, and economic changes unlike any these organizations have seen before. New technologies are raising questions about the very purpose for which libraries were founded. Copy protection in most ebooks makes them difficult (impossible or illegal) to lend in public libraries, and even as libraries struggle with that, the natural shape of knowledge is changing. Video games are a new form of literature, while internet-only content is often every bit as valuable for library patrons as books or ebooks. Ebooks pose their own set of technological and legal limits, but now the right of first sale that allows libraries to buy and circulate printed books has been repealed in the US Second Court of Appeals. And if that weren’t enough, libraries are bound by historical public expectations (“If the service in question was the only service offered, could the library get local tax dollars to do it?” The answer for everything except book-lending is “not likely.”) and a stagnant economy that has hamstrung library funding, forcing many libraries to cut back staff and hours. Libraries are optimized for stability; optimized to be low-cost distributors of culture and knowledge in each community. 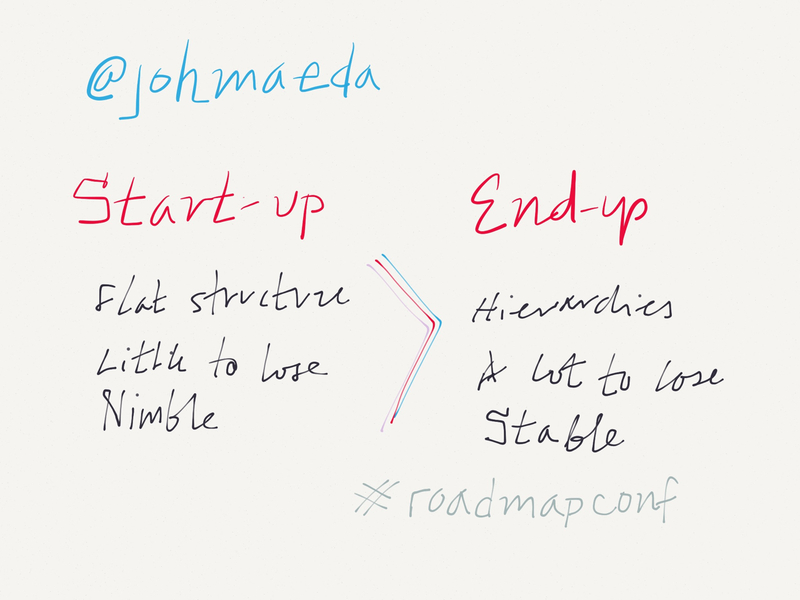 That optimization has worked well when the legal, economic, and technical foundations were solid. It’s also crippling innovation in the face of the real crisis libraries are now struggling with. Addressing this isn’t as simple as minimizing costs for established services. Addressing this requires real strategic planning to identify and leverage opportunities, or at least to prepare for challenges. But how? The answer, of course, is to turn it into a game. You’ll have to commit yourself to renting a very expensive booth at the conference, you’ll have to staff it for three days, and you’ll have to be the most cheerful and energetic person in the exhibit hall. You are, after all, hacking for good. 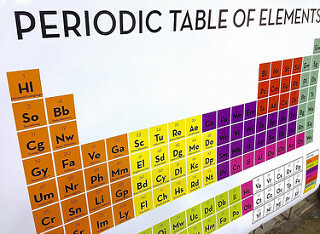 Osum scientists created a Library Science Periodic Table of Elements populated with external factors (and predictions) that affect California communities, and by extension, California libraries (like “wearable computers” or “low science test scores among 2nd graders”). 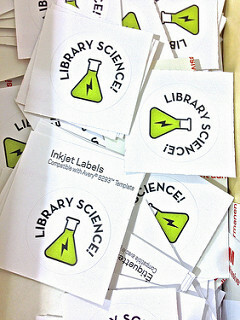 Visitors to the Osum booth will receive element trading cards, along with a Library Science sticker that can be worn on conference badges (so everyone knows you’re a scientist!) and an observation log. Recruits will seek out other Library Scientists at the conference. When scientists meet, their elements cause a chemical reaction! Scientists will exchange cards and discuss hypotheses: What happens when the two elements interact? How can libraries respond? Scientists can record their hypotheses and observations on the observation log. Osum Labs will compile and analyze the results. 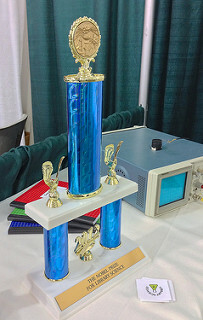 As a reward for their scientific research, each observation log returned to the Osum booth counts as an entry into a drawing for the grand prize trophy for the Nobel Prize for Library Science. “Greetings library scientist,” Patrick exclaimed to draw unsuspecting conference attendees into the booth. He was prepared for each librarian with a sticker in hand. He’d place it on their badge while explaining the game. 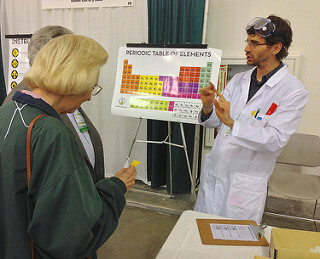 This periodic table is not technically periodic, as one attendee pointed out proudly, but it’s colorful and fun way to track the element cards you’re trading. 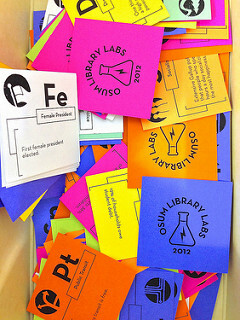 The element trading cards represent actual and imagined conditions that may affect libraries. The trophy for the Nobel Prize for Library Science goes to the library scientist with the most innovative reactions and thorough observations. We’ll see this again, hopefully at another conference, but I expect somebody else will copy it for a management training seminar. I’m not saying good things about management seminars, just that mimicry is flattery. Nice work Heidi, Patrick, and Paula!